Racepond, GA--The Fellow Travelers attempt an assault on the Okefenokee early e ach October. 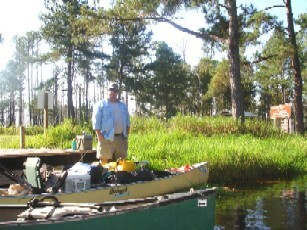 On October 1, 2009, ten brave souls gathered at Kingfisher Landing for a three-day expedition to Bluff Lake, Round Top, with take out on Saturday at the Suwannee Canal Recreation Area near Folkston. Rick Metz and Richard Mayotte spent the night in Waycross, Roy and Eric Moye and Diane and Charlie Stines spent the night in Folkston. 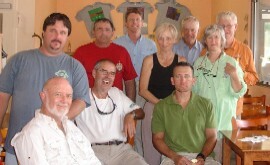 They met with Greg Baker, Jerry and Donna Ellis, and Greg Ferrell at Kingfisher early in the morning. No one was late. Rick, the Gregs, Jerry, and Roy shuttled the vehicles back to the take out while the rest swatted mosquitoes and yellow flies at Kingfisher. Once the shuttle was completed the canoes were loaded. Greg Baker soloed his Magic, Greg Ferrell used the Prism alone, Donna and Jerry borrowed the Canadienne, the Moyes used their banana boat Mohawk, Rick and Richard paddled the Penobscot 17, and Charlie and Diane paddled the Escape for its first O kefenokee adventure. The paddling began about ten in the morning. The weather was really nice. The temperatures in the day would be on the warm side and the nights were just about right for sleeping. The King’s Canal was built to extract peat from the swamp. The first mile is almost straight and is easy canoeing. At the one mile marker the Red and Green trails separate with the Red Trail leading to Maul Hammock and Big Water and the Green trail leading to Bluff Lake and the junction with trails to Floyd’s Island, Suwannee Canal shelter, and Round Top. The group headed out on the Green Trail toward Bluff Lake. 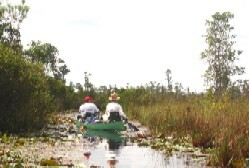 The trail was somewhat shallow but was not clogged with water lilies and bladderwort this trip. Although not in a hurry, the pace was rather fast. Shortly after eleven the first of several pair of sandhill cranes flew over. Diane and Charlie lagged somewhat behind but about noon they reached the five-mile marked where Richard and Rick were patiently waiting for the stragglers. Everyone was again together and it was time for lunch snacks in the boats. At about one fifteen the navy reached the seven-mile marker meaning there was less than a mile to the shelter. Before reaching Bluff Lake the trail crosses a couple of very small swamp lakes. Bluff Lake is a rather large body for a swamp lake and the shelter is on the far side of the lake. It was in very good repair. The swamp has largely recovered from the fires of two years ago but there is still evidence of burned trees along the way. Once at the shelter the canoes were unloaded and ten friends set up chairs and relaxed. Rick fished a little but was not too successful. The resident alligator provided some entertainment but his begging went unheeded. Charlie had brought crickets for fish bait but Rick amused the crowd by feeding some to a green anole. 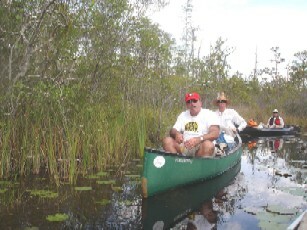 Rick and Richard managed to swamp their canoe but they were not in it. The only damage was to Richard’s camera. There is no word as to whether or not it survived. The King was in charge of supper so he fried chicken, cooked an excellent cake of corn bread in the Dutch oven, and prepared potatoes. Art was not along so no one complained about chicken. After supper the travelers pitched the tents. Once pitched the 10’x28’ shelter became crowded but the group sat around telling lies and watching the beautiful Okefenokee sunset. A few sandhill cranes were seen and heard. It was a starry n ight with a near-full moon. Owls hooted and frogs played an off-key symphony. Bedtime came fairly early and everyone slept well. There were no complaints of snoring but judging from the participants there probably was some done. Roy Moye has won accolades as the premier Fellow Traveler chef. He and Eric made a great breakfast of breakfast burritos. After that camp was broken and the canoes were loaded. The paddlers were on the water at eight forty-five. The Green trail from Bluff Lakes begins with some pretty canoeing through a rather pretty forest channel but soon becomes very shallow, twisting, and obstructed. The paddlers began to wonder if they had taken the correct trail but Greg Baker led the way through some difficult maneuvering. It was almost ten by the time the paddlers reached the nine-mile marker. The trail began to open before the ten-mile marker was reached at about ten thirty. 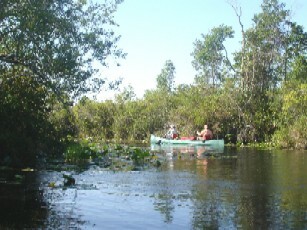 The route then was through canopied forest and relatively open water through cypresses, pines, and mixed h ardwoods. About noon the tired travelers stopped for lunch in the boats. The usual apples, candy, sardines, Vienna sausages was eaten along with left-over fried chicken. The wildlife was not as plentiful as normal but there were some alligators, ibises, a few sandhill cranes, and some songbirds and wading birds. The trail had morphed into prairie as the group paddled toward the junction of the Blue and Purple trails. It was about two fifteen when the Purple trail was reached. Again, Charlie and Diane were behind the group but Donna and Jerry were waiting. Diane was trying out her new eight-ounce ZRE fiber paddle which she had allowed Charlie to use for most of the trip. She allowed Donna to use in gratitude for Donna’s waiting. The Purple Trail is totally prairie. It winds a bit but is not particularly difficult. The gentle breeze cooled the paddlers but did not interfere with the progress. It was well after three when the flotilla arrived at the Round Top shelter. The stinky outhouse was a most welcome attraction. The shelter was in good shape except that the outhouse was in bad need of a visit from the honey wagon. The lazy ten sat up chairs and conversed before Jerry and Donna fed them a barbecue supper. It was delicious and Donna claimed she made it herself, but then lying is expected on canoe trips. It was a pleasant evening. Again birds and frogs sang lullabies. The night was satisfyingly cool and all got a good night’s rest. 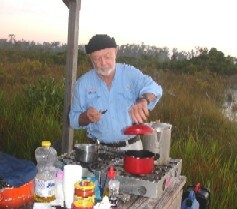 Rick and Richard cooked a traditional breakfast of sausage, grits, eggs, and fruit. All thought it was a good job. It is three and a half miles of canoeing through prairie along the Purple Trail before it joins the Suwannee Canal about nine miles from take-out on the Orange trail. The canal is wide and is like a moderately-sized river. A few alligators were spotted before the gang reached the Coffee Bay shelter twelve fifteen. Lunch was gourmet--fruits, beef jerky, sardines, and Vienna sausage. Rick fished a bit and caught a bream but it was not a keeper. From there it was on toward the take-out at Suwannee Canal. It was a nice paddle but there was a threat of rain. It did not materialize. Once at the take-out the canoes were loaded, everyone ate some ice cream, and then went home after a fine Okefenokee trip.